Lou Potts: Jeez, I sent you to cover a piece of fluff, and you come back with a hostage situation. everyone- it's not your average mainstream Hollywood movie. However, it IS a brilliant, scathing satire of the media's true power in modern-day society. Instead of going for overkill like the pathetic "Natural Born Killers," this movie uses dark comedy, brilliant performances, and genuine thrills to create one of the most clever and powerful social commentaries to be seen in film in years. 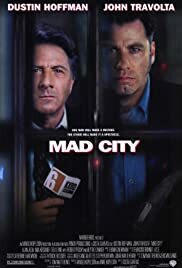 If you're expecting a typical Hollywood thriller with a formula plot and a nice, neat ending then you'll be disappointed, but if you're looking for a smart, powerful film with brilliant performances by Dustin Hoffman and John Travolta, then I would recommend this movie. In a time when events like the O.J. Simpson trial make the media's influence in our society more than apparent, it's refreshing to see a movie willing to stare this issue right in the face.